We are hopping with a special guest - The inspiring Amy Koenders. I only recently purchased the new 2016-2018 In Colour collection, and they are such an awesome collection of colours, I just can't understand why it took me so long. 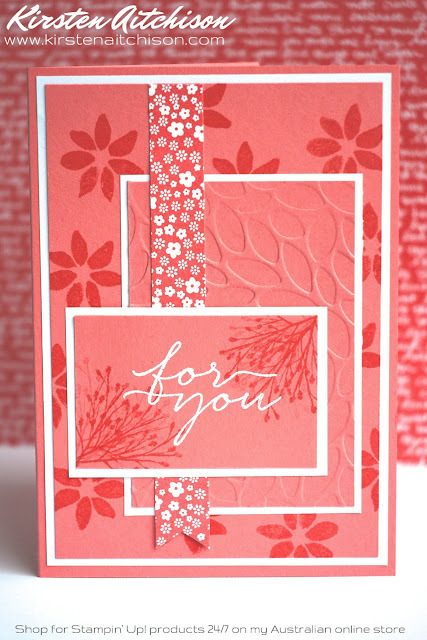 So .... like Amy, I decided to make a set of cards using all of the colours in this collection. 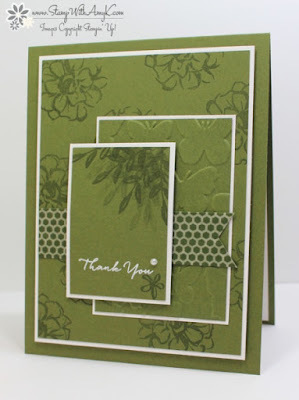 I just loved the layout of Amy's cards as well as how she stamped the images in the same colour ink as the cardstock. To make mine, I cut out 3 different sized rectangles (see below for the sizes**) in each of the new in colours, and stamped one of the small flowers from the Blooms & Wishes sets in a random pattern on the largest pieces in the matching ink colour. The middle sized pieces were run through my big shot with the Petal Burst embossing folder. For the smallest pieces I used the stamp off technique (to get the lighter images) with one of the bud branch images from the Blooms & Wishes stamp set and just stamped the image a number of times in the same area. 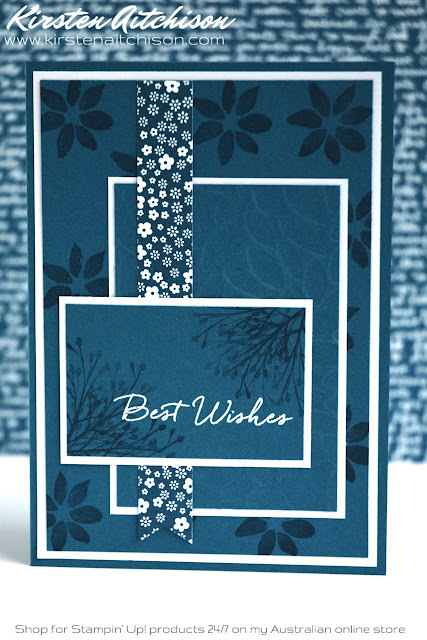 My sentiments also come from the Blooms & Wishes stamp set and were stamped in Versamark ink and heat embossed using White embossing powder. I adhered my coloured cardstock pieces on to some Whisper White cardstock and then trimmed them all to have a small white border. Before assembling my cards using snail, I cut a small DSP strip of each colour from the In Colour Designer Series Paper stack, and used the Triple Banner punch to cut the bottom of each strip. 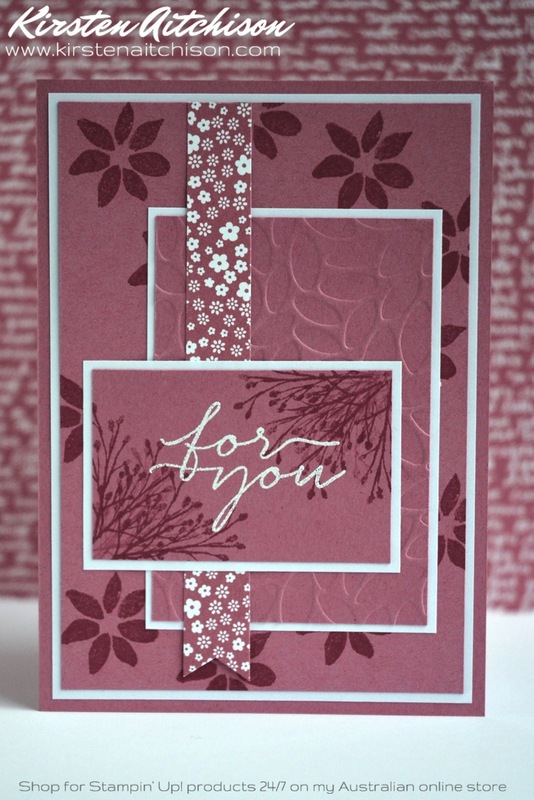 Love your CASE of Amy's card and the long banner of print paper adds interest to them. 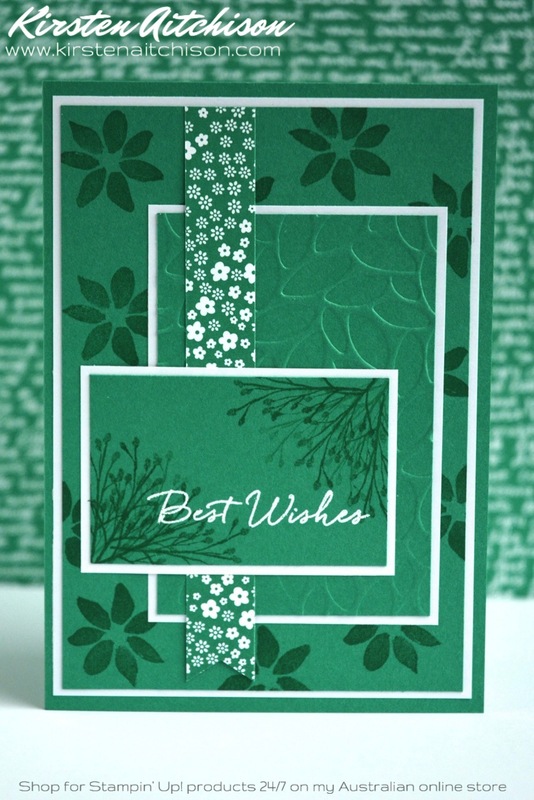 What a great collection cards to have on hand and showcases the colours brilliantly as well. Wow!! These are awsome Kirsten!! Fantastic cards - TFS. 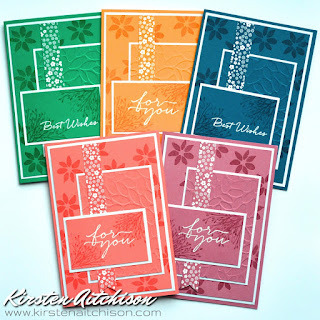 Great idea for stamp a stack Kirsten, Fun bright and cheerful. 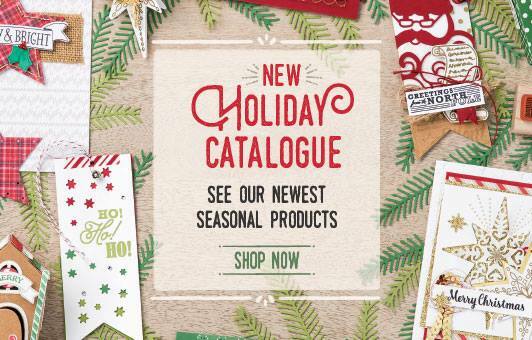 These cards will bring a smile to the faces of those who receive them! I love these Kirsten! How good do they look in all 5 new In Colours, well done. These are awesome. 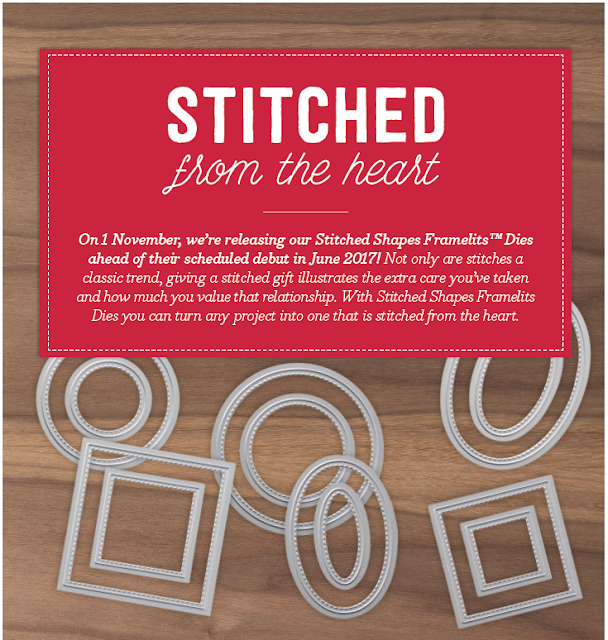 Before I read your blog I thought you'd stamped them with versa mark to get that effect. 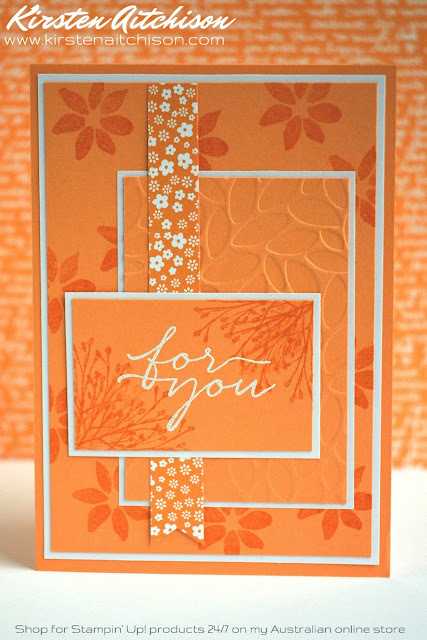 Love the idea of stamping with matching ink on the card stock. Don't think I've ever tried this. They all look so fabulous! These are awesome! I love the in colours and this does them so much justice. Wow!! 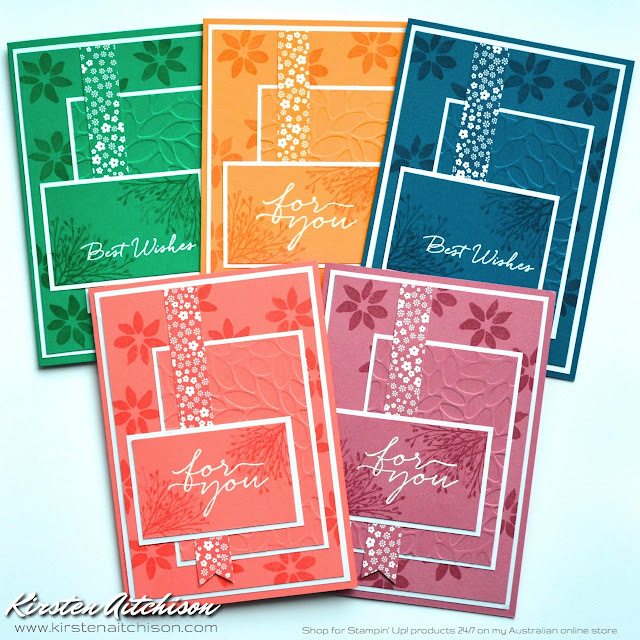 These cards are amazing Kirsten! 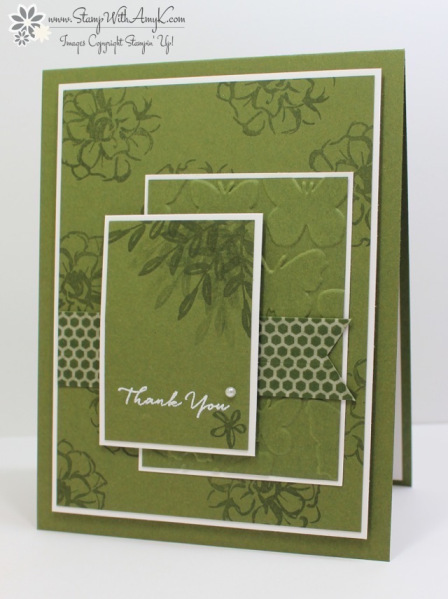 What a great way to showcase in colors! !